Although a majority of Canadians (51%) said they are not interested in the marriage between Prince William and Kate Middleton taking place on April 29, a new poll from Abacus Data finds that six in ten Canadians (59%) believe that the Prime Minister should attend the wedding, even though the wedding is three days before the federal Election Day. The survey found that a majority of respondents in each region of the country believed the Prime Minister should attend the wedding. 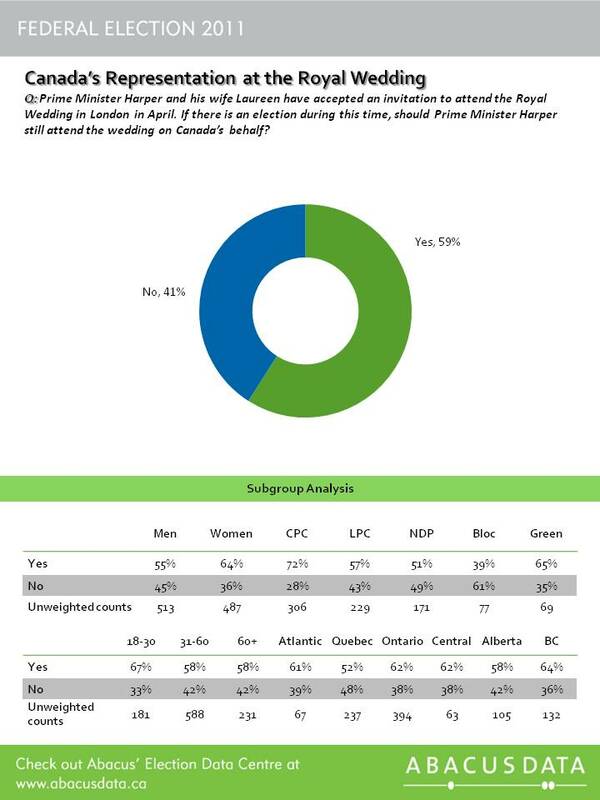 However, Quebec respondents were the least likely to believe the Prime Minister should go to London for the wedding (52%). In terms of general interest in the wedding, one-third of Canadians aged18 to 30 (the millennials) were interested in the ceremony, compared with half (50%) of older Canadians (60 years old and up) who showed some interest. This older generation was also the group most likely to say they were very interested in the wedding and wished they could go. Not surprisingly, women were more interested in the Royal Wedding. Over 50% of Conservative supporters indicated an interest in the wedding (47% somewhat interested, 12% very interested) as did Liberal supporters (41% somewhat interested, 11% very interested) while most NDP and Bloc supporters were not interested at all (56%, 79%, respectively). The Royal Wedding is on April 29th and is being held in London.